In an office on the fourth floor of a building in East Jerusalem, a group of Palestinian women wait impatiently. They are here to see their lawyer, but she is busy on the telephone. It is a hot day and the windows are open in a vain attempt to air the stuffy room. A picture on the wall catches my eye. It is a painting of Palestinian prisoners sitting shackled on the ground in a desert camp, watched over by menacing-looking Israeli guards. I notice that the room is adorned with pictures - all of them depicting scenes of Palestinian suffering. "Everyone fights with their abilities - the Israelis have helicopters and rockets and the Palestinians have nothing but themselves and some very primitive home-made explosives." As I sit there wondering about the images, I am brought back to reality with a jolt. "Come," commands a woman with a gravelly voice. "Sit," she says, gesturing towards a chair. "Now, what is it you want to discuss?" she asks. The woman is Lea Tsemel, a straight-talking lawyer, well-known and respected by human rights groups in Israel for her work with Palestinians. To many Israelis, though, she is anathema. Her business is to defend would-be Palestinian suicide bombers who have been captured by Israeli security forces before they could blow themselves and others up. "It is hard to say how many bombers I represent," she says, but agrees it is probably in the dozens. Born in the Israeli port of Haifa in 1945, Ms Tsemel was 22 when Israel captured the West Bank and Gaza Strip in the 1967 Six Day War, the outcome of which, she says, affected her profoundly. "Only in the '67 war did I realise really what it was all about. Until then I was a very moderate Zionist woman. Lea Tsemel: "Everyone fights with their abilities"
"The occupation made it very clear to me that there was something wrong, and I started to ask myself all kinds of questions and came to the conclusion that Zionism is negative and bad, and that we are oppressing the Palestinians. "Since then my future career was more or less determined." "I grew up in an Israeli culture where suicide attackers are really heroes. Look at Samson, who in order to fight the Philistines in Gaza made the theatre collapse on himself and all the civilians there. He is a very big hero among Jewish children. I grew up on the myth of better suicide than surrender. So what is so special about suicide bombers?" 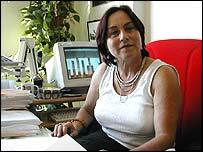 Ms Tsemel represented Palestinians accused of violence in the first intifada, in the days before suicide bombs were the militants' favourite weapon. "It used to be Molotov cocktails, but it has changed. I see suicide bombings as just another development - a technical development, nothing else. Such "primitive" home-made explosives have killed hundreds of Israelis and maimed countless more, many in the streets just yards from where we are sitting. Despite their devastating effects, Ms Tsemel says she understands the motives behind suicide bombings. "I grew up in an Israeli culture where suicide attackers are really heroes", she says. "Look at Samson, who in order to fight the Philistines in Gaza made the theatre collapse on himself and all the civilians there. He is a very big hero among Jewish children. "I grew up on the myth of better suicide than surrender. So what is so special about suicide bombers?" I suggest that many Israelis would find her views hard to digest, but Ms Tsemel is firm in her convictions. "I don't understand why people would find my views abhorrent. If you ask any Israeli to put himself in a similar situation of occupation and oppression for 36 years - everyone would say they would do the same, including [Israeli Prime Minister Ariel] Sharon. "I never heard any similar criticism from those Israelis who are shocked by the killing of women and children in suicide attacks, of an Israeli rocket attack that kills Palestinian civilians." Ms Tsemel says she has never asked any of her clients why they chose to become suicide bombers because to her it is abundantly clear. "I don't support such actions or see this as the solution, but I can very well understand how suicide bombings became a very popular way of fighting - first, because it is quite successful; secondly, because people are ready to risk everything in order to achieve some progress in the national struggle. "They feel it was something they had to do. No-one that I know was tempted into it. They all volunteered themselves. "Those who were stopped before they could explode their bomb are happy they were not killed and they see it as a sign of God, that God did not want them to die." But do they ever think that what they set out to do was wrong? Ms Tsemel sits back and clasps her hands. "Some regret their actions," she says. "It happens."